It’s sitting in front of the shop that says “Ye Old Trading Post.” There are so many vendors at Suzanna’s that I have to really pay attention to where I see things. This table is wood, very nice lines and just needs a bit of sanding to make it ready for your next project. What could you do with this? Well, first of all, it’s a perfect coffee table. It could also be a craft table for kids. It could be a console in front of a low window, holding plants or family photos. 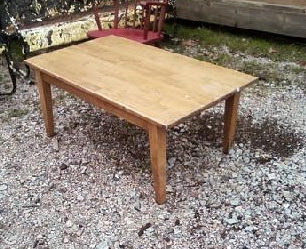 It could sit on the front porch or the screened-in back porch. It could be painted a snappy shade like lime. Marine blue. Coral. Panetone’s-color-of-the-year honeysuckle (pink). It could just be stained or even given a clear coat(or 3) of satin poly that lets the wood grain shine. Or how about having a stainless top fitted over it? Better, yet, a copper one. I’m looking for a local source to do that very thing on another old piece. Need a creative interior designer to help you come up with ideas like this? Well, check out my website and give me a call! Oh! Didn’t I tell you the price on this? $15.00. Yes indeedy, $15. I had to take myself by the hand and walk away from it so that I could give you a fair shot at it. I was at Suzanna’s for about 10 minutes when I spotted this and had already found a couple of other “finds” to show you. This one won out because it has the combination of decent quality to work with, nice versatile shape AND a price that can’t be beat. You are welcome. Enjoy the weekend. Oh my gosh, this place is SO GOOD. 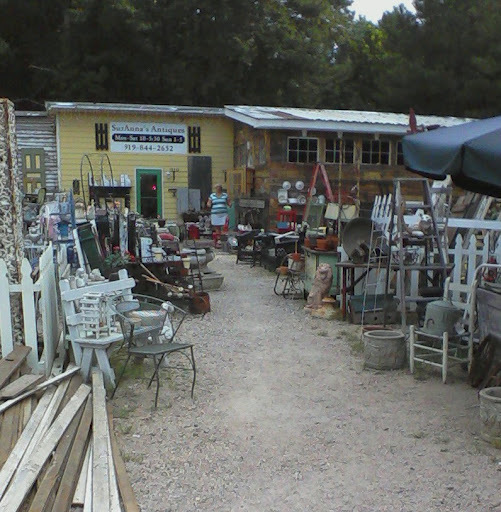 Suzanna’s Antiques on Durant Road in Raleigh is chock full of stuff! I’ve only been visiting this store for a little over a year, but every time I go, they’ve grown again, switched things around and added more vendors. Now they’ve gone and added another building! This new addition means that most of the store is now totally indoors (used to be very opened up and no heat, no air conditioning), so it’s a much more comfortable place. I could easily furnish much of an entire house here, regardless of the owner’s style. There’s a lot of architectural salvage, loads of dressers chairs, table, lamps and accessories. Many things could be repurposed in all sorts of ways. Truly the epitome of Green Design. Nothing is “new.” Great prices. Some things need elbow grease and imagination–my favorite tools. I know, I sound like a commercial. Don’t mean to, but I so enjoy places like this. There’s even a guy who sells fresh veggies and fruits. Just take a look at SuzAnna’s blog and then head over there. This is just a small slice of the place.